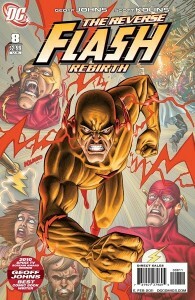 ICv2’s sales estimates for the month have Flash #7 selling 56,304 copies, and Flash #8 selling 53,975. Overall comics sales were down in December, as reflected in the fact that #7 went up in rankings even though it sold fewer copies than #6. The book shipped twice this month. A storyline concluded last month, making #7 a good jumping-off point. #8 is the first issue without the Brightest Day banner on the cover. #8 shipped the last week of the year, between Christmas and New Year’s. Any late shipments or reorders won’t factor into these numbers. They’re fill-in issues. Good fill-in issues, but still stand-alone comics by a different creative team, pushed in between major stories to get the book back on schedule. The only thing today’s market hates as much as a late book is a fill-in issue. It will be interesting to see if #9 (the start of a new story, not to mention some high-profile speedster guest stars) climbs back up a bit or continues to drop. 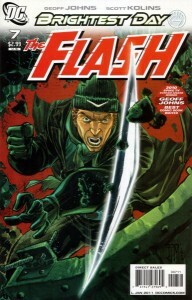 Green Lantern #60, featuring a Parallax-possessed Flash on the cover, took the #2 spot. Of the 11 books ranked higher, 4 were Green Lantern or Brightest Day, 4 were Batman titles, 2 were Avengers and 1 was Wolverine. That’s some solid company for the Flash. T.H.U.N.D.E.R. Agents #2, focusing on the team’s speedster Lightning, sold 11,227 copies for a rank of #165. Velocity #3 clocked in at 5,305 copies, ranked #263. I seem to recall that Top Cow considers this book a success (though it’s pulling half the numbers of Artifacts or Witchblade), which should tell you just how big a gap there is between the size of the DC/Marvel market and the size of the Indie market. *Yesterday on Twitter & Facebook I mistakenly reported that they were #26 and #29, a big drop, but when looking back at the chart, I realized I’d been looking at the wrong column. Those were the dollar rankings, which differ from the units-sold rankings depending on cover price. This entry was posted in Flash News and tagged Sales, THUNDER Agents, Velocity on January 11, 2011 by Kelson. I haven’t read the first issue of the new T.H.U.N.D.E.R. Agents series, but when I read that issue #2 was going to feature the origin of their speedster, Lightning, I decided to take a look. The concept: An international team of covert operatives use suits that give them super-powers…knowing that the powers will kill them. Despite being the middle of a bigger story, the issue reads quite well. It’s structured with a framing sequence in which the team is on its first mission. It’s not entirely clear what they’re doing, except they need Lightning to get inside the perimeter. To do so, he’ll need to run faster than he has ever run in training…and he’ll learn the true cost of super-speed. This is wrapped around the story of Kenyan athlete Henry Cosgei, two-time Olympic winner and three-time world champion, a man who loves life, but most of all loves running…and the brutal way in which T.H.U.N.D.E.R. manipulates him into joining the team. By the end of the issue, he sees all too well what he’s given up in order to regain what he’d previously lost. There’s good character work, not only with Lightning himself, but with the two handlers. There’s some depth here beyond the mindless slugfests, continuity strip-mining, and roster shuffling (though there is a bit of the latter here, since it’s an origin story) that seems to make up so much of the super-hero landscape these days. 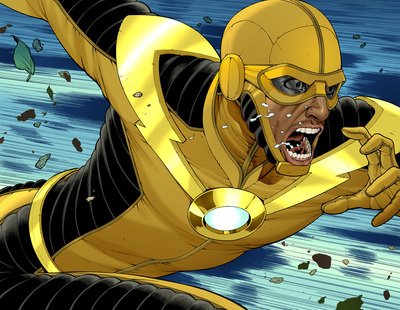 This entry was posted in Other Speedsters, Reviews and tagged CAFU, ChrisCross, Lightning, Nick Spencer, THUNDER Agents on December 13, 2010 by Kelson. ChrisCross is no stranger to speedsters. Two years ago, he was all set to draw the scrapped Velocity series that would have spun out of Top Cow’s first Pilot Season. He completed at least one issue and several covers. The interior art hasn’t seen the light of day, but Top Cow has been using the covers as variants on the current Ron Marz/Kenneth Rocafort Velocity miniseries. 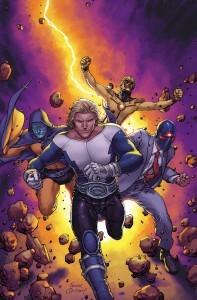 THUNDER Agents #2 goes on sale December 8. This entry was posted in Other Speedsters and tagged CAFU, ChrisCross, THUNDER Agents on November 19, 2010 by Kelson. DC has posted a 3-page preview (4 if you count the two pages of the double-page splash) of T.H.U.N.D.E.R. 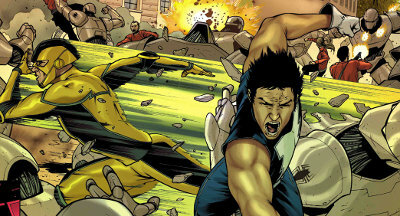 Agents #1, including art of the team’s resident speedster, Lightning, in action. T.H.U.N.D.E.R. Agents #1 by NIck Spencer and CAFU arrives in stores November 10. This entry was posted in Other Speedsters, Timely and tagged CAFU, Preview, THUNDER Agents on October 23, 2010 by Kelson. DC has posted artist CAFU’s designs for the T.H.U.N.D.E.R. Agents relaunch coming in November, including the team’s speedster, Lightning. Lightning’s past is one readers of the sports page will be familiar with. It’s one of failure, self-doubt and, ultimately, redemption – if he can manage to outrace death long enough, that is. 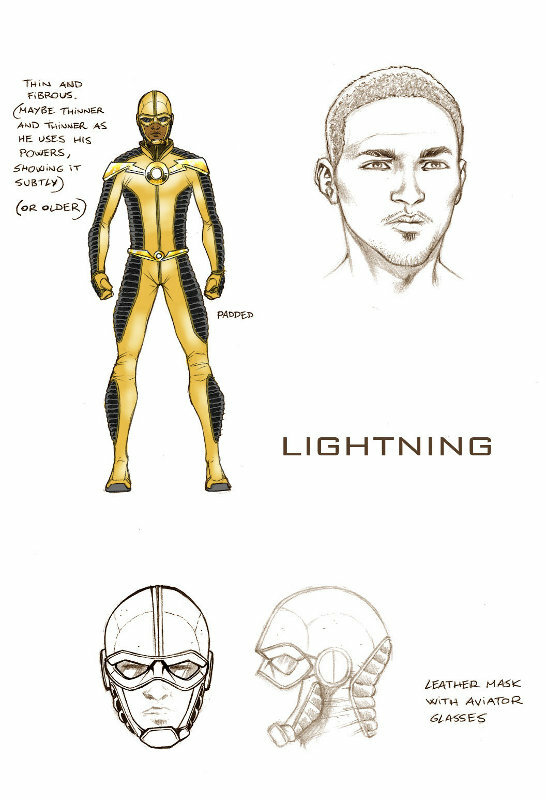 CAFU came up with a number of designs for Lightning’s suit, but we ultimately settled on this one as it seemed both the most stylish and the most practical. Zipping around that fast, you’re going to need some protection! As described in previous articles, the premise is that the suits that give the agents their super-powers will also kill them within a year. The agency recruits covert operatives willing to trade their lives for one last shot at redemption. The article at The Source has four designs, including Dynamo, NoMan, and Menthor in addition to Lightning. Also worth a look: Newsarama’s article on the history of the team, back to their 1965 debut at Tower Comics. This entry was posted in Other Speedsters and tagged CAFU, THUNDER Agents on August 18, 2010 by Kelson. Last year at Comic-Con, DC announced that they had acquired the rights to the T.H.U.N.D.E.R. 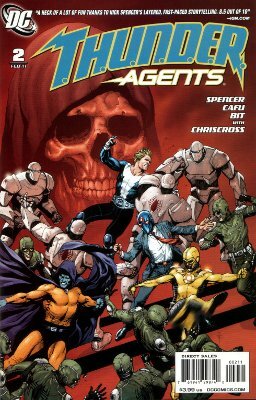 Agents, a covert team of international super-heroes operating under the authority of the United Nations. The characters were originally published in the late 1960s by Tower Comics, and have been revived several times over the last few decades. Among the classic members of the team is Lightning: former Special Forces agent Guy Gilbert wears a suit that gives him super-speed…but every time he uses that speed, it ages him. The new series casts the team as a covert special ops force dealing with global threats the rest of the DCU don’t even know exist — all the while struggling with their own choices to become agents and the tortured pasts they’re running from. With character-first storytelling and threats exploding from real-world headlines, this relaunch of T.H.U.N.D.E.R. AGENTS will offer something new, different, and daring for both today’s broader comics audience and fans of the original team. 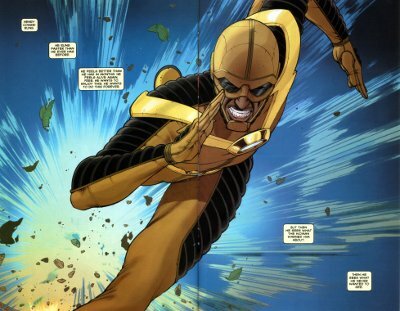 This entry was posted in Other Speedsters, Timely and tagged CAFU, Frank Quitely, Nick Spencer, THUNDER Agents on July 19, 2010 by Kelson.